Hello everyone, I hope you are all well. As I sit and write this I'm full of germs, just a cold but phew it's so annoying. I've not crocheted all weekend and still don't feel like it today. Hopefully tomorrow I'll pick it up again. M bought these pretty pink Asters for me last week, I've enjoyed their bright colour particularly at meal times. More pink in the kitchen with a new orchid, this is the third one I have now. I wouldn't say I've a lot of success with houseplants, though Christmas cactus usually survive. Spider plants seem to thrive in a steamy shower room. I'd read somewhere about placing a spider plant in a bathroom to absorb moisture. I'm not convinced one plant alone is sufficient but one will have to do. I won this in the WI raffle prize last week. Whenever I've won a prize, I've always felt a sense of urgency to make up my mind quick! It was my turn on refreshments this month so on hearing my number, I escaped the washing up briefly, to choose a prize. My poor tendon is suffering lots after the entertainment of Country Dancing. Yes it was enjoyable but too much walking about and it's swollen to bird egg size now. I need to step up the stretching exercises again, gently and slowly first and hopefully it will heal again. Surgery isn't really an option as the success rate is very low, also it's extremely gruesome. Feeling yuk, I've sat reading my library book details here complete with it's shiny jacket. Cottage by the Sea is Debbie Macomber's latest book and starts off with a very sad disaster. The story follows a predictable pattern of the couple getting together, then retreating to lick their wounds before ending happily ever after. There are highs and lows but surprisingly no knitting in this story. Often Macomber's books feature a character knitting, or some cooking. Being an American author, I love how she describes relationships and spending time with people generally. I hope you understand what I mean, I think it's the intimate expression of thoughts (not particularly romantic) that reveal their feelings. I never read English stories that have the same 'friendly' terminology, it's as if all feelings must be contained. At the moment I'm re-reading this book details here. Again a predictable pattern but enjoyable nevertheless. An extremely unlikely couple get together despite opposition from a controlling Mother. Lighthearted and easy to read which is good at the moment, though having read this before I'm remembering some of the arguments and weak storyline. 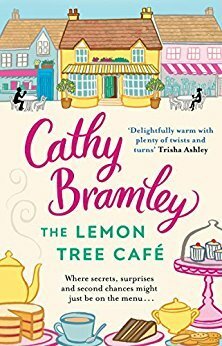 This book details here The Lemon Tree Cafe is one I'm listening to on audio books. I hadn't realised it was actually 4 books in one - I wondered why the story was going on and on and on. The individual book titles are here if you want to read them separately. In many ways it has the fun element of a Jill Mansell with the 'hidden secret' element of a Milly Johnson. Bramley mentions the WI quite a few times albeit very loosely. I would definitely read or listen to more of her books. With all the talk of lemons, I felt like baking some lemon shortbread. This particular recipe is gluten free, it's very simple to make and can be made as an all in one method. I put all the ingredients into a food processor and when it starts to clump together, press it into a lined tin and bake. Unfortunately it's all gone now, so tomorrow I need to make some more. The Lemon Shortbread recipe is in this free book. The address and postal details can be found on the flour packet. I couldn't find details about the book on-line but the address is in their contact details. Originally I think they'd requested a self addressed A5 envelope - uk. I realise there are no photos of QT today, sorry. He's enjoyed writing my blog sometimes, with many of you asking to see him. At 17 years old he's slept an awful lot lately and been very fussy with his food. He's very fluffy and spreads a lot of fur all over the house, carpets and blankets everywhere. I'm often mystified as to why cats groom themselves so much, especially 'himself' as he swallows clumps of fur, often daily. I try to groom him most days, which may sound excessive but it's the ingested fur that puts him off eating. He's much improved with frequent grooming and occasional doses of Katalax type meds. The thyroid meds - we now give orally through a syringe, in the past we've squirted it into his food. With his recent fussiness over meals we can't rely on this method benefitting him anymore. I tried sock knitting after reading A Good Yarn - Debbie Macomber, tried Dubonet after watching Hetty Wainthropp Investigates on TV. I can't say I enjoyed that drink, it was an acquired taste that I won't be trying again. There's probably been more things I've tried but these are the most memorable. Thank you for stopping by, as always I love to read your comments. I'm still catching up with blog reading and hope to take some more photos of QT for next time. Hope you feel better soon. Those flowers are beautiful! I don't have the best luck with houseplants...I had a good run about 2 years ago but now I'm back to a blah plant-less house. Perhaps it's time to try again. Maybe I'll look into a Debbie Macomber book, I could use a bit of light reading after my current read about American foreign policy. Thank goodness it's not inspiring me to run for any political office-ha! Have a great week. Hope you feel better soon. Love the look of the lemon shortbread, it would make a nice addition to afternoon tea. Sorry to hear you're unwell, I hope you're on the mend soon. I was given an orchid for my birthday, almost identical to yours. I don't bother much with houseplants but orchids are very forgiving and don't take much looking after. I've never read a Debbie Macomber book but I feel I must give one a try if her books feature characters who knit. When I was watching Shetland I decided I want to drink more tea because they make it seem so comforting. Maybe I'll have a cuppa now. Sorry to hear that you've been under the weather and I hope you'll soon feel better. It's a shame that the country dancing made your tendon more painful, but when the music starts up one wants to join in. I don't suppose there's a chance for you to rest up until the swelling calms down. The lemon shortbread looks tempting. I'm not surprised you'll be making a replacement batch! Those pink asters are beautiful, and I love your pink kitchen woodwork - so pretty. I must try making lemon shortbread as I'm a shortbread fan. It's been nice to catch up with your blog. The lemon shortbread looks delicious! The flowers are such a beautiful colour.